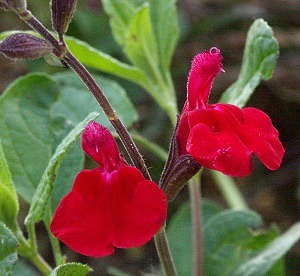 Maraschino Cherry Salvia has large lipstick red flowers that, like many Salvias, are exceptionally attractive to hummingbirds. They also makes a tasty garnish for a summer salad or brunch stir-fry. Try adding a handful to cornbread or pound cake. Chop slightly and add to butter or sour cream. Be sure to remove the bract (the flower petal holder). These can be tough and/or bitter. In the photo to the left there are two Maraschino Cherry bushes that are about four years old. In this photo they are a little over two feet high and about two feet wide each. We prune them to about eight inches above the ground in late fall or early spring. 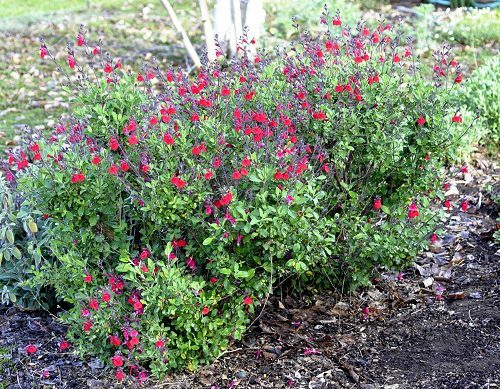 Maraschino Cherry Salvia is one of the six plants included in our fun Kid's Herb Garden Six Pack and it makes a great addition to our Edible Flower Herb Garden Six Pack. This plant is often available in plug trays. These trays hold 128 of all the same plant. They are a great low cost way to fill a lot of space. Each cell is 3/4 of inch by an inch. Check here to see if Maraschino Cherry Salvia Plug Trays are available.